Ash is a timber species widely spread in Europe,USA ,Russia as well as in North China.As in the past few years white ash tree has has been over cutting in North China ,now very difficult to see large scale big ash trees forests there.The P.R.C government has banned exporting chinese ash related solid wood products currently.All manufactuers in china are using imported ash wood from Europe & Russia to produce hardwood ash flooring. oak.Ash wood toplayer is very popular to be used on furnitures,cabinets,wall paneling etc due to its beautiful mountain grain.Ash wood has very good machinality,it works well with nail,screw,& glues.The wood can be easily stained with many different colors,that's why the manufactuers prefer use ash produce wood flooring,the customer really like the unique styles of ash wood flooring. Solid ash heartwood is not as strong as oak in decay resistance,it has moderate resistance to decay resistant preservatives. C&L hardwood supply ash solid Acacia flooring flooring in different Grades - Premier Clear Grade and Character Grade.Ash wood is naturally demarcated in sapwood & heart wood.Character grade ash flooring has very strong contrast in color tones.The natural styles are so unique that the westerners like very much. C&L hardwood mill the ash wood parquet wood with four side Tongue & Groove Joint,board to board fit perfectly to each other,very easy to installation.Each board is with slightly 45°Micro-beveled Edge,which makes the the floor looks perfect. Normally Ash raw wood is properly dried under a MC of 12% in order to produce a qualified timber floor.C&L hardwood factory present a report as a proof that each batch of all our timber floor keeps with moisture content in the range of 10%-12%. 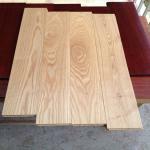 Solid Ash flooring from C&L hardwood is sealed by primer pu finish on six sides on floor board , it enhances the dampness resistance to guarantee the board stability after long time use. Surface coating is applied by 8 layers primer finish,4 layers top finish.The top finish we use germany treffert aluminium oxide UV coating which greatly enhanced the scratch resistance of the timber flooring. C&L hardwood Ash solid flooring has a warranty of 25years structural under proper maintenance.7 years surface UV coating wear though warranties.5 times more sanding and refinish on the floor board is absolutely possible.